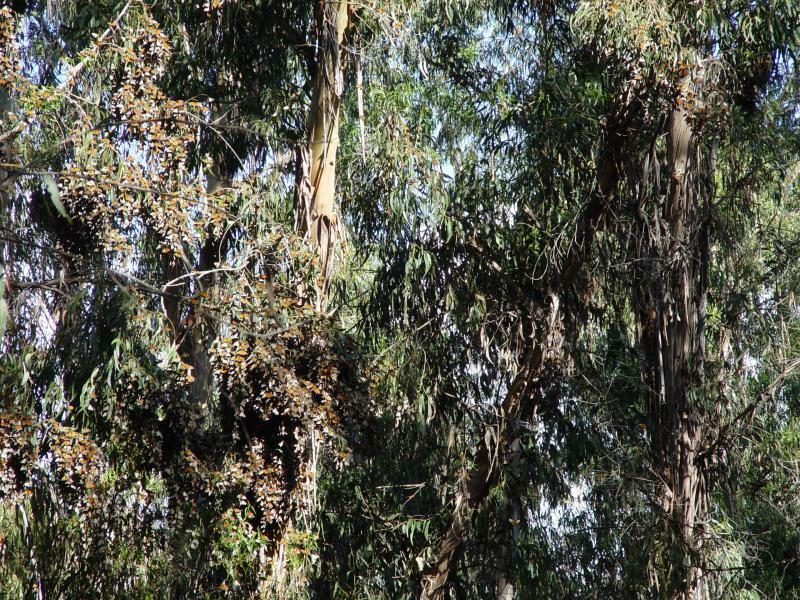 Monarch butterflies on Eucalyptus trees during migration. Ellwood Beach bluffs in Goleta CA. KCLU's John Palminteri reports on a sensitive butterfly habitat on the south coast receiving state money for a restoration project. Governor Jerry Brown included $3.9 million of funding in his just-signed budget for the Ellwood Monarch Butterfly Grove in Goleta. State Senator Hannah-Beth Jackson was pushing for the funds, and the city of Santa Barbara says the grove, which is on a trail near a coastal bluff, is a significant resource for the community. The grove is visited by thousands of people annually and studied by researchers from UC Santa Barbara. Photographers in particular have taken advantage of the beauty of the butterflies while they fly or rest. The site is currently closed while a tree health assessment is taking place due to impact from the drought.